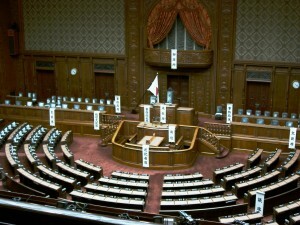 Japan’s House of Representatives room. We were all holding our breaths to see the Japanese government making an official move towards hosting the ILC. A small but significant move happened as a Christmas present. On 24 December 2013, the Japanese cabinet released the government budget proposal for the Japanese Fiscal Year 2014 that will be voted on in the Diet early this year. It includes an official budget line for the ILC. This is highly important as it represents a qualitative change in the status of the ILC in the Japanese government and indicates that it is now a recognised project. Given the majority of the ruling coalition in both Houses, it is virtually guaranteed that the budget proposal will pass. “The economic growth strategy” is a reference to Abenomics, a proactive economic policy by Prime Minister Shinzo Abe. The budget for the ILC is listed together with the research grants from MEXT. The amount itself is small: 50 million Yen (about US $500K). However, this is highly significant symbolically, as the ILC is recognised as a project of the Japanese government. Note that this is not an R&D budget. The R&D budget is supported through KEK. It is rather a specific budget for the Japanese government to seriously study the feasibility of an international framework for the ILC as a global project, as mandated by the recent report from the Science Council. We look forward to even bigger movements this year!